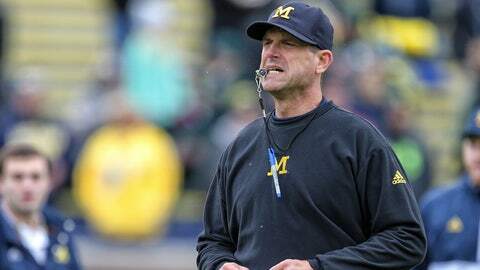 ANN ARBOR, Mich. (AP) — Sure, Jim Harbaugh plays the what-if game. The Michigan coach acknowledged Tuesday that running the ball on sweeps toward the sideline to take more time off the clock was something he considered on first, second and third down in the final minutes against Michigan State. Instead, the Wolverines handed the ball off to De’Veon Smith three times and he gained 8 yards. On the pivotal drive that ended with a botched punt, Smith slightly surpassed his average per carry on 19 rushing attempts Saturday. That left Michigan with a fourth-and-2 at the Michigan State 47 with 10 seconds left. Wolverines punter Blake O’Neill bobbled a low snap, fumbled the ball away and Jalen Watts-Jackson was in the perfect position to return the football 38 yards to give the Spartans a stunning 27-23 win at the Big House. "You’d love to have that opportunity to do it again to see how the other way worked," Harbaugh said. The Spartans rushed O’Neill with 10 players and sent no one back to field the potential kick. In the end, it didn’t matter. Michigan State coach Mark Dantonio and his assistants have been analyzing the pivotal play, too, since their big win in the rivalry. "You try to practice every situation," Dantonio said. "We always do and we all practice these different situations, but I don’t think we practiced one quite like that where that’s been the scenario. So I think it just created a pause in all of our minds as a staff, `OK, what would we do in that situation? How would we handle it?’ And I’m sure that there’s a lot of that going on right now across the country relating to what happened in the game just because of the nature of it." At least the Spartans get to play again this week. No. 7 Michigan State (7-0, 3-0 Big Ten) hosts Indiana (4-3, 0-3) trying to avoid an upset that would spoil its Big Ten and national championship hopes and a potential showdown at No. 1 Ohio State on Nov. 21. The 15th-ranked Wolverines (5-2, 2-1) don’t play again until Oct. 31. More time to think about the loss — and more time to move on. "We’ll look at it as an opportunity week to improve," Harbaugh said. "We’ll look at this last game, for example. There’s never one football play in a game that decides the game. We’ll look at the things that we things that we improved on, did well, and put us in a position to win the game. And we’ll also look at the ways that we could improve so we can make the outcome a winning outcome."